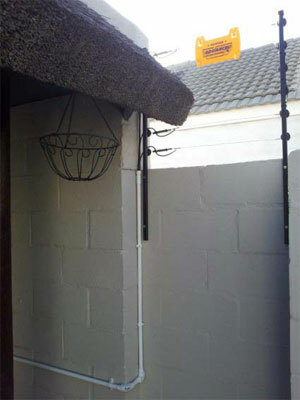 Around 2006 it was clearly noticed that there was a definite increase in electric fence installations in the Cape area. This was due to the increase in burglaries and crime. ADVANCED ELECTRIC FENCING was established to fill the need to combat crime mainly in residential areas, also in the industrial and agricultural sector. We pride ourselves in giving 100% customer satisfaction by ensuring attention to detail and service excellence. With residential installations all over the peninsula, including Fire Stations and Factories, ADVANCED ELECTRIC FENCING can provide a list of contactable references for referrals. 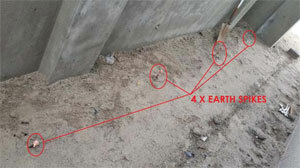 4 x 1.2m length earth spikes 1.2m apart. 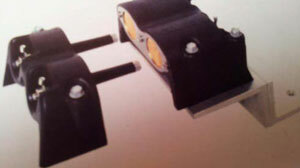 2 x lightning arrestors/diverters fitted in an approved weatherproof box. 1.5m from the ground level to the lowest fence wire. 200mm from any corner bracket to the fence warning sign. 1m space between horizontally mounted PVC conduit saddles. 50m per section of fence wire in order for tensioning of wire by means of compression springs. 10m between electric fence warning signs. 3. All electric fence H. V. cables running through sealed PVC conduit. (Including cables running through walls). 4. Crimped ferrels or line clamps sprayed with a protective layer to connect all electric fence joints. (No wrapped around wire joints). 5. 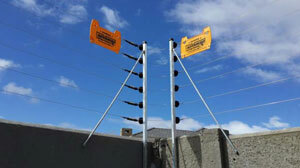 Approved sliding gate contacts to supply power to the gate fence and not pieces of illegal chain. There are many more regulations and standards to comply with – see STANDARDS on our website. One can clearly see where certain installers can charge less by taking short-cuts. 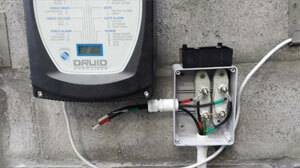 WE AT ADVANCED ELECTRIC FENCING CANNOT AFFORD TO TAKE SHORT-CUTS AS IT WILL TARNISH OUR REPUTATION.